2. ATTEND Citizen's Water Lobby Day in Madison on February 8! It's time for all people and groups who have an interest in clean and abundant water to join forces! 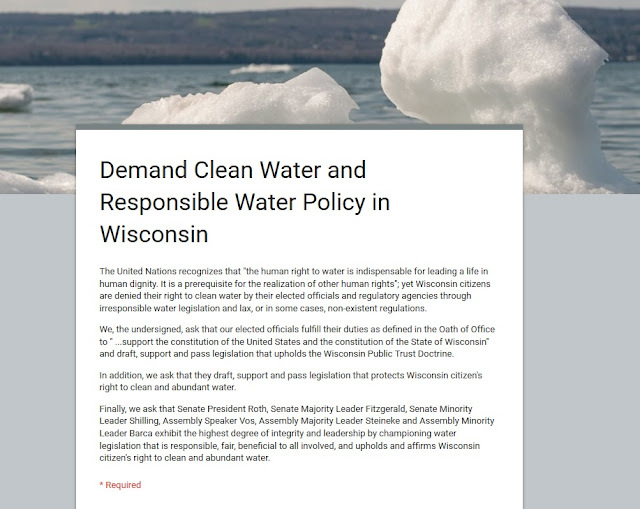 Water is the common ground among the frac sand, mining, pipelines, high capacity wells, and CAFO grass-roots groups in Wisconsin and we believe that it's long past time for a Citizen's Water Lobby in Wisconsin. The day will go from about 11 a.m. to about 3 p.m. and will include speakers and meetings with our state senator and representatives. Face to face meetings with our representatives are important! Those who sign up will receive a list of talking points. Take advantage of this opportunity hosted by the Sustain Rural Wisconsin Network. We hope to see you at the Citizen's Water Lobby Day in Madison on February 8th! Take this opportunity to unify our voices and strategically focus on what we need -- elected officials who are willing to stand up and fight for our rights to clean water!